Last night I saw the moon when I stepped out for some fresh air and nicotine. It's probably a good thing, I took a few practice shots. The weather for full moon photography, this month, is looking pretty grim. Right now winds are blowing out of the east and dark skies are headed my way. 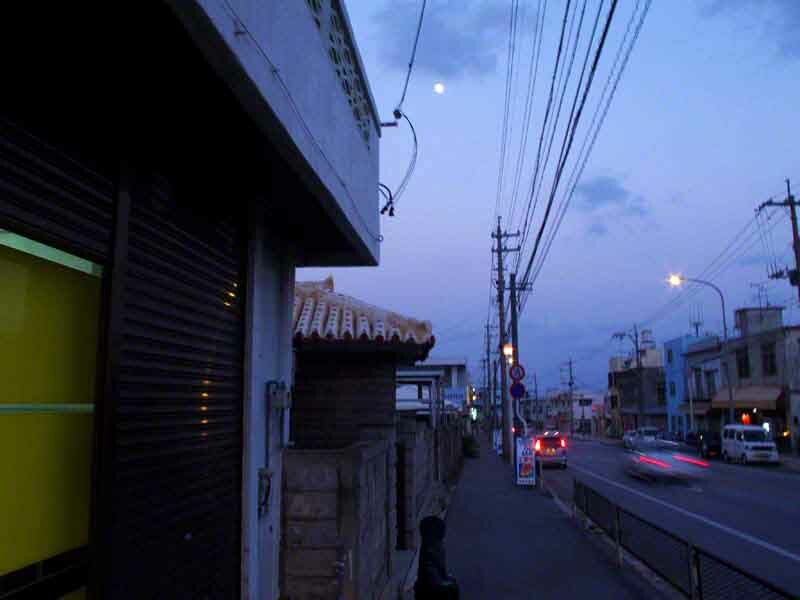 But, this is Okinawa, Japan. The weather can change every five minutes, sometimes. Here's where I was at 6:52 last night shooting the moon. It was a little bit windy then, too. So, I put the tripod way down low and sat on the ground. If the clouds break, I'll be ready tonight. The full moon for this month is actually March 27th. 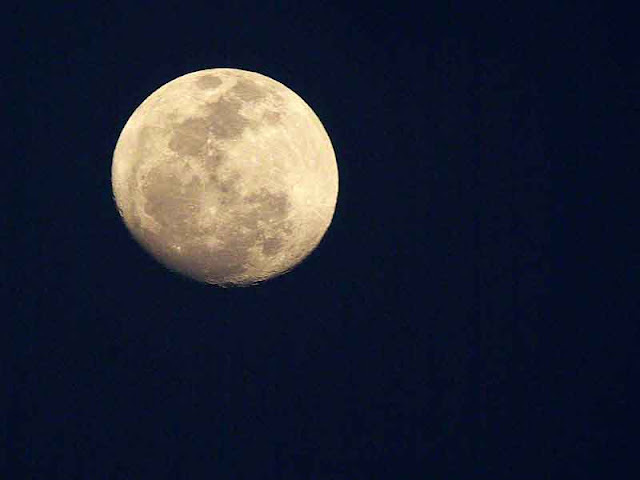 But, its a good idea to shoot the moon the day before its full. 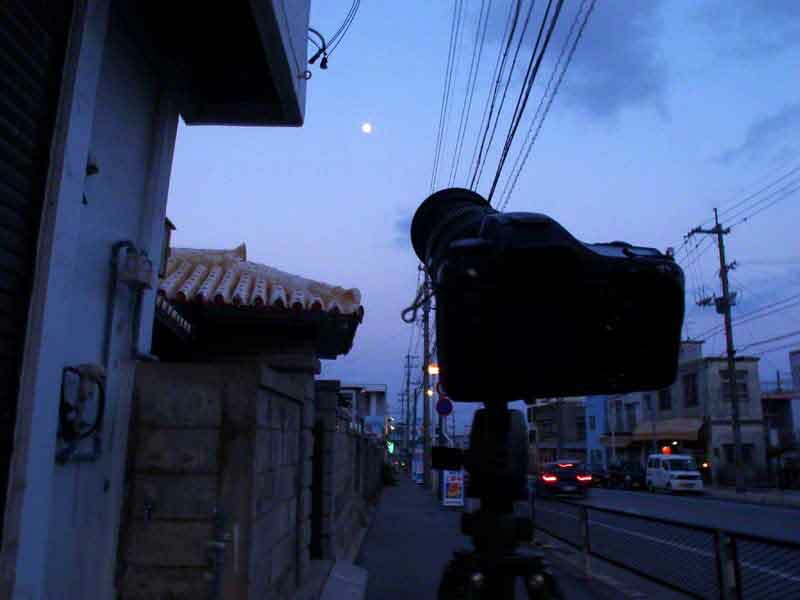 Another great time to shoot, is the morning after the full moon. You can catch it in blue skies. The little sucker pops up in a different position every night. Ever notice that ? Well, an unscientific explanation is, it's because earth is spinning. The moon rises about 54 minutes later, each day. So, at 6:52PM it won't be where it was last night. Groan. With the weather changing every five minutes and a couple of hours to kill, who knows ? Maybe, I'll be sitting on that sidewalk again tonight. And, maybe I won't. Some information on shooting the moon may be found in my Photo Tips. Another great resource is the Digital Photography School. Huh? Bamboozled Got Nuthin' to Do with Bamboo? Wiktionary Should Hire Me to GROWL ! Photo Essay: Could These Be Hero Butterflies ?